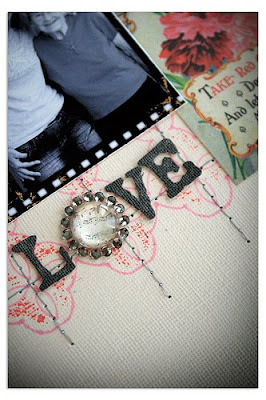 Introducing our double the inspiration theme is Mercantile Monday. Each Monday we'll walk through the gallery again, looking for new inspiration that we can learn from. 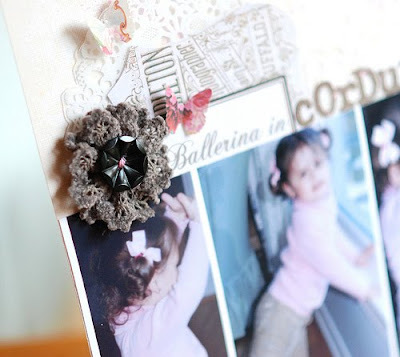 Today we're going to focus on the details that make each layout shine. Here is a peek at Wilna's gallery that will go live tomorrow night with the gallery updates. This gorgeous creature was treated to some artistic brilliance with Wilna's glue gun and some glitter. 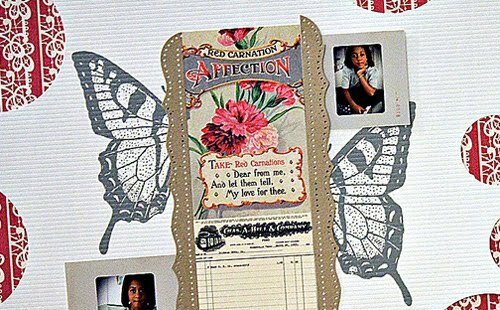 The beauty of the red and black color scheme in this month's kit is that it is so easy to add another color or two to make it suite your scrapping needs. 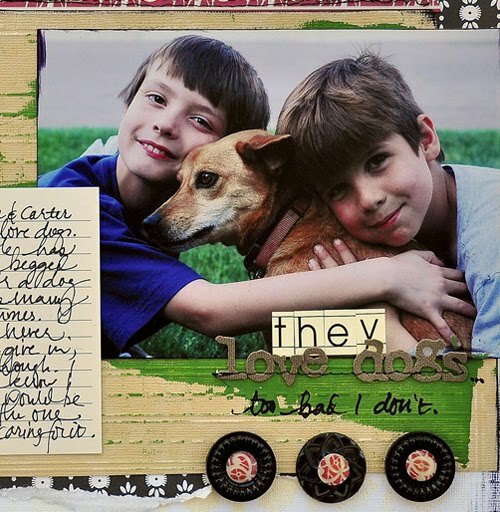 Here Doris added some orange medallions punched from cardstock from her stash and green label stickers from the project kit for a perfect fall themed layout. 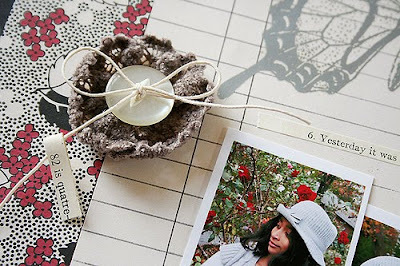 Ranjini pulled in some extra detail with these charming little tags floating on button twine bows. Lisa has been doing such brilliant things with the stencils lately. This month she did a little misting and outlining with the full sized stencil from the add-on kit. Keisha decided to shake up her style just a bit. I love the result. The funky look of the split butterfly suites her style setting daughters so well. 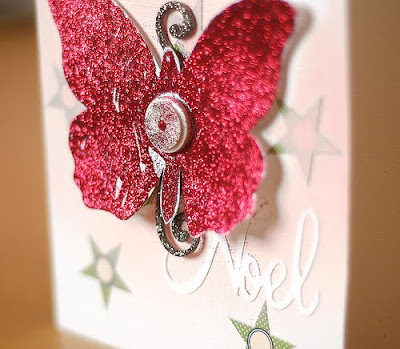 What a great look Kerry Lynn achieved with circle punches. 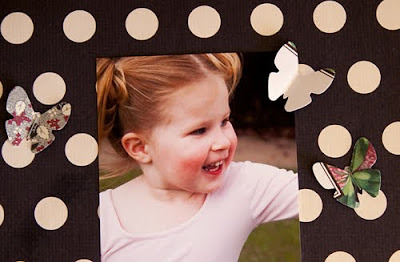 She just layered two varying sizes to make a great scalloped border. 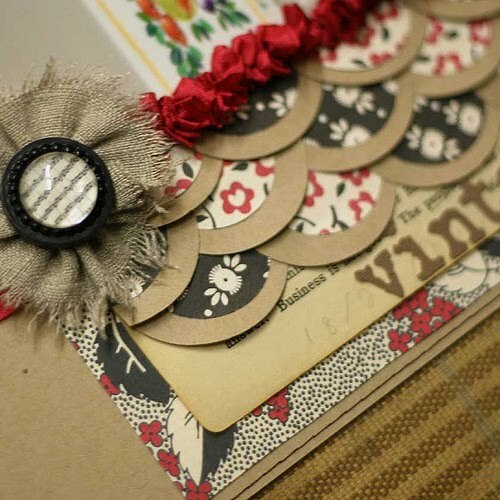 A little birdie also told me that there would be a mini tutorial on making her fabulous gathered ribbon trim too. The silver rub-on butterfly is truly a classic. I love seeing the unique approaches our designers come up with for it. Jill's signature stitching is no exception. The vintage style sew-on buttons are fast becoming another of our classic pieces. And again I am amazed by their versatility. Here dina simply set a half inch punched circle inside and painted over it with glossy accents for a great custom look. Danielle is so brilliant with the layering. The snowflake/flower/button combo was fabulous, but then she added the baker's twine. Brilliant. Did you notice how popular the flowers made from the velvet trim were? Just run some floss along the edge in a basting stitch and then pull it tight and tie it off to make a little gathered flowers. I am always so in love with Becky's eclectic paper combinations. These butterflies are no exception. 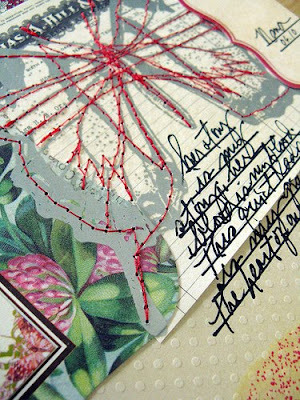 Some are punched from journaling cards and some from mini papers. The butterfly punch is Fiskars. I need it. We hope you've found some new inspiraton that you may have missed the first time around. 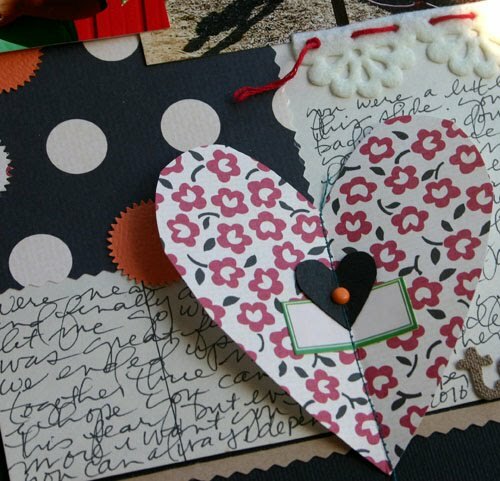 Be sure to share your work in the customer gallery. We'd love to see it! They are all just fantastic-your DT is awe inspiring. 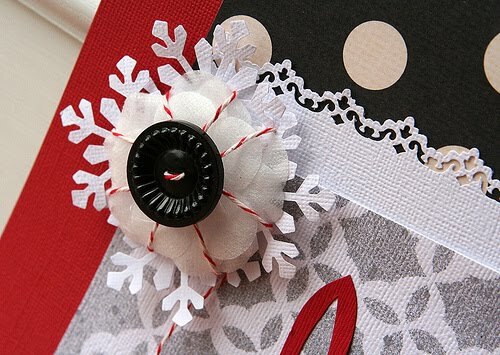 I adore the snowflake, button, flower combo! I must lift this! I'll be looking for the ribbon tutorial. Thx for listening. Love everything you all do @JBS.